The Rain Collection And Purification system (RainCAP) is a foil sheet tank that is made of sturdy and durable plastic sheet material. The foil tank is installed in the ground and used to collect/capture up to 70 m³ of rainwater. Once needed for consumption, the water is pumped up from the foil, purified and distributed as drinking water to the consumers. The RainCAP foil structures can be easily transported, installed and maintained. It is often installed in combination with our UV WaterBox. The foil tank can be cleaned from the inside and removed if needed. • Easily transported, cleaned and replaced upon demand. 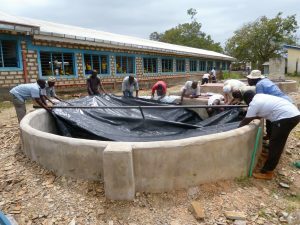 The RainCAP is designed for usage in tropical counties with modest to high rainfall. We focus both on family level (from 5- to 15 m³ tank) and on village level (tank size 15 – 70 m³ each). The tanks follow a modular design and can be linked to each other dependent on your needs. The 15 m³ tank serves an extended family of 30 people for 8 months consuming 2 liter p.p./ day. 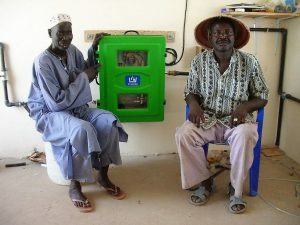 The 70 m³ tank serves a village of 200 people drinking 2 liter p.p./ day for almost 6 months. • The 15 m³ tank (for families) ranges 3,2 meter in diameter and extends 2,5 meter deep into the ground. • The 70 m³ tank (for villages) has a diameter of 5,0 meter and ranges 4 meter into the ground. Capturing rainwater is best done using existing roof systems. Schools, medical centers and governmental buildings can be often deployed for that purpose. Rainwater gutters alongside of the roofs collect the rain falling down. 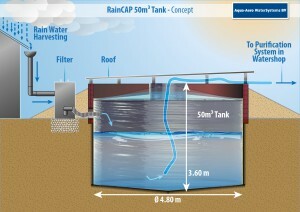 The RainCAP system is attached at that point to take care of the filtering, storage and purification of the water. The total of the collected rainfall is dependent on the condition of the roofs, the gutters and the level of maintenance in combination with the local rainfall pattern. The RainCAP system is best applied in tropical regions displaying moderate to high rainfall. The systems can be installed in relative soft ground (compacted sand, silts, etc.). It is advised to avoid sharp rock surfaces in order to prevent puncturing of the foil material. The foil tank system is manufactured using strong and durable plastics. Collected water can be stored for a period of up to 8 months dependent on the level of maintenance.